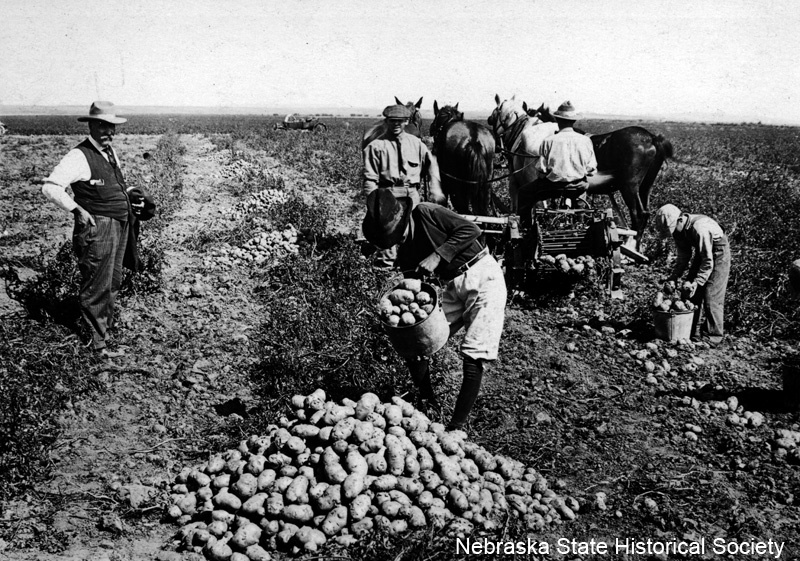 A labor shortage during World War I left western Nebraska potato farmers facing the loss of their crop. They brought in Lakota (Sioux) Indians as harvesters, beginning a tradition that lasted from 1917 through the 1950s. The story is one both of prejudice and understanding, cooperation and conflict—and of long-lasting relationships forged by economic necessity. David R. Christensen writes about it in “‘I Don’t Know What We’d Have Done Without the Indians’: Non-Indian and Lakota Racial Relationships in Box Butte County’s Potato Industry, 1917-1960.” The article appears in the Fall 2011 issue of Nebraska History. As the sun rose behind the Sandhills, illuminating the sky to a reddish-orange tint, a Lakota family emerged from their white canvas tent ready for the day's potato harvest. Two Lakota men and women crossed the farmyard to the corral, where they helped the farmer hitch horses to wagons and to the potato digger. An elderly Lakota woman remained in the tent, brewing coffee and looking after the children-who were already scurrying about the farmyard playing "cowboys and Indians." A dusting of frost on the grass, dirt, and equipment signaled the need to finish the harvest before a hard freeze ruined the potatoes. The Lakota women's feet felt the sting of the morning chill through their moccasins. With the horses hitched, the farmer, his sons, and the Lakotas left for the potato fields to finish the harvest. En route, the sons and Lakotas engaged in a friendly conversation and wager regarding which group would pick the most potatoes-even though the Lakotas always won. Such a scene occurred annually on almost every farm in Box Butte County, Nebraska, during the first half of the twentieth century. Although anti-Indian prejudice was always present, the potato industry improved racial relationships between Lakotas and non-Indians, even resulting in enduring friendships. At the edge of the Sandhills, Box Butte County is located in the center of the Nebraska Panhandle. Today the county has only two incorporated towns: Alliance, the county seat, and Hemingford, eighteen miles away. In the 1910s expansion of the county's potato production created a need for migrant labor. Until about 1960 Lakotas from the Pine Ridge and Rosebud Reservations in South Dakota came to work the potato harvest. Before the 1930s both farmers and other non-Indian county residents mostly treated the Lakotas well, grateful that their labor saved the potatoes from rotting in the fields. Likewise, the Lakotas were pleased to have jobs where they were paid, fairly treated, and appreciated by non-Indians. 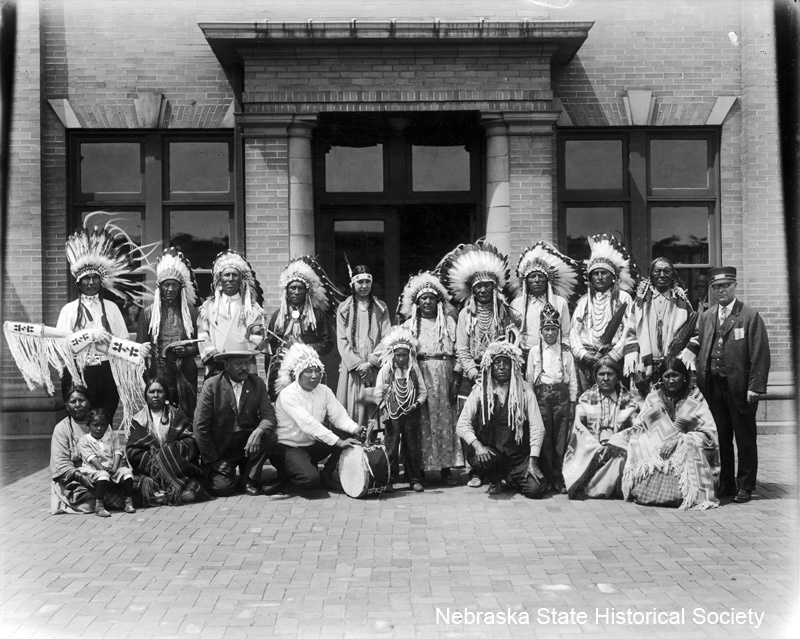 Although migrant labor exposed non-Indians to Lakota culture and initially helped dispel mutual stereotypes, racism and prejudice eventually soured relations between the two groups. During the Great Depression and World War II, the once welcoming communities in Box Butte County expressed anti-Lakota sentiments. Many farmers who hired the same Lakota families for decades rejected the towns' prejudice; still, relationships between farmers and Lakotas were susceptible to the fluidity of the potato market. Periods of drought, depression, crop disease, and low potato prices resulted in low wages, which at times combined with alcohol-related problems to strain relationships. Scholars have revealed that migrant labor was essential to the late nineteenth and early twentieth century expansion of western extractive industries. American Indians used wage labor as a means of subsistence and community building, oftentimes entering and leaving wage labor at their own discretion. Many different systems of labor emerged, but Native peoples relied on their vast kinship networks for support, and strengthened their cultural identities while creating non-reservation Indian communities. Building on this scholarly framework, I will argue here that social relationships between non-Indians and Lakotas are a crucial and neglected part of interracial dynamics in western Nebraska. The poor race relations between Lakotas and western Nebraska residents are well known. Lakota scholar Vine Deloria, Jr., referred to Alliance as "a town almost as notoriously anti-Indian as Gordon [Nebraska]." Even so, emphasizing racial tension overlooks cases of racial understanding and cooperation, and misses the complexity of Lakota and non-Indian relationships forged during the early twentieth century potato harvests. Settlers of Box Butte County in the 1890s soon discovered its agricultural potential, and in the early 1900s local farmers began to see potatoes' promise as a cash crop. Western Nebraska's altitude-3,500 to 5,000 feet-results in lower temperatures essential for greater tuber growth. Its sandy soil improves the development of a tuber's size and shape. Cool nights, light rainfall, and few insects make for ideal conditions.